There are so many wonderful details in this party I don’t even know where to start! 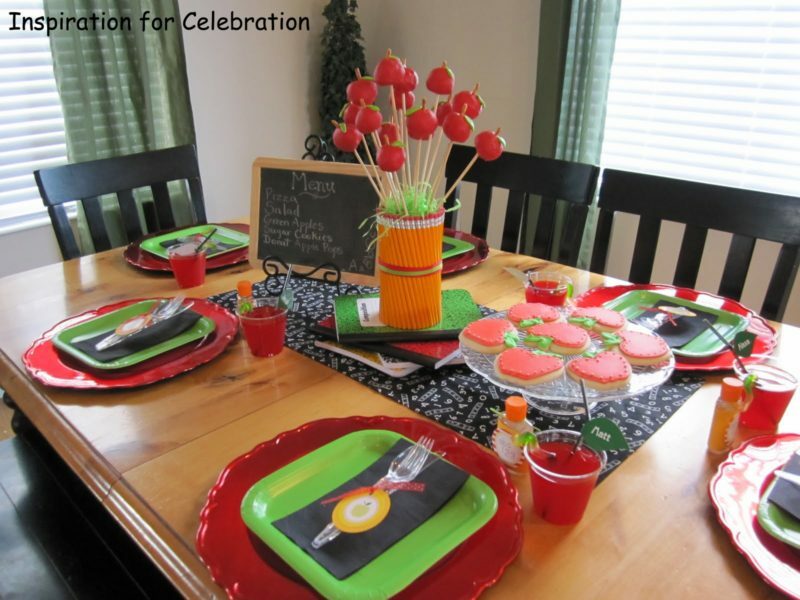 I found this party on Catch My Party and contacted Christina to ask her if I could share it. One of the best things? It’s totally budget friendly! This would be perfect for a wrap up to Back to School week! Christina says: “I had a lot of fun putting this table together. One of the best parts is that I spent very little. 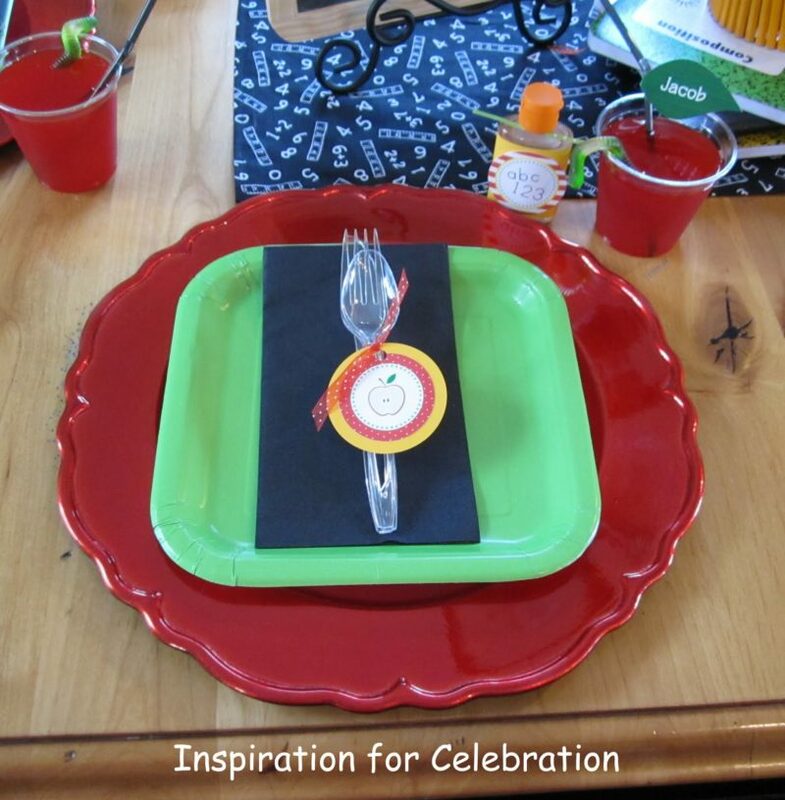 I mostly used things I already had on hand (plates, napkins, utensils, cups, straws, chargers, easel, cake plate, vase, paper, ribbons, cookie ingredients etc). I was lucky to have the paper goods left over from past birthday parties and to borrow an apple cookie cutter from my Mom. I did use up my Americolor Meringue Powder (gift from my husband, boy does he know me well 🙂 so I will have to force myself to make a trip to Orson Gygi to buy some more. The apple drinks were a hit, especially the gummy worms! You can see the tutorial and leaf template here. I found these red chargers on clearance a few years ago at Walmart. The great thing is that I can use them for lots of holidays and celebrations (Christmas, Valentine’s, New Years, Birthdays). I love these free printables from Magnolia Creative Co. I love that they went well with my apple theme and the colors (red, yellow and green) were perfect. 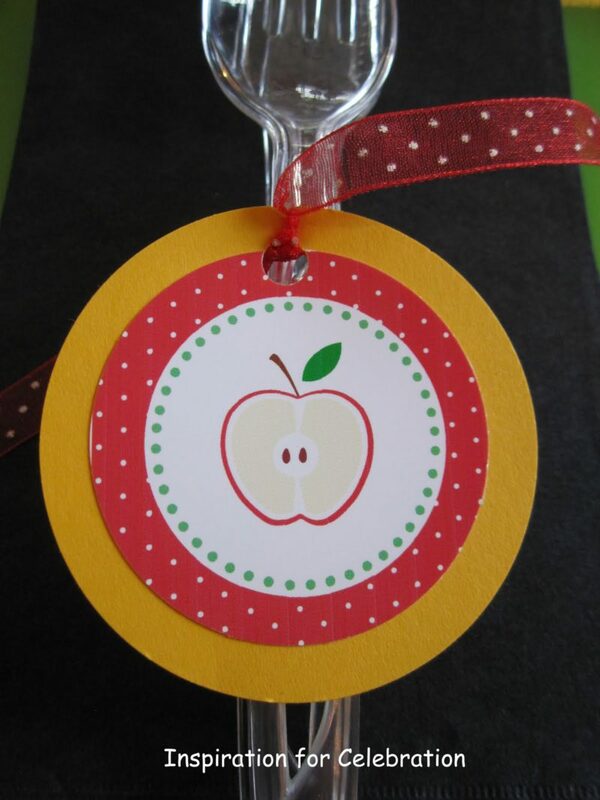 I also used the Magnolia Creative Co free printables on these little backpack favors. Each child got a small hand sanitizer to put in their new backpacks. My 8 year old and I hemmed this cute piece of fabric from Walmart to make a table runner. 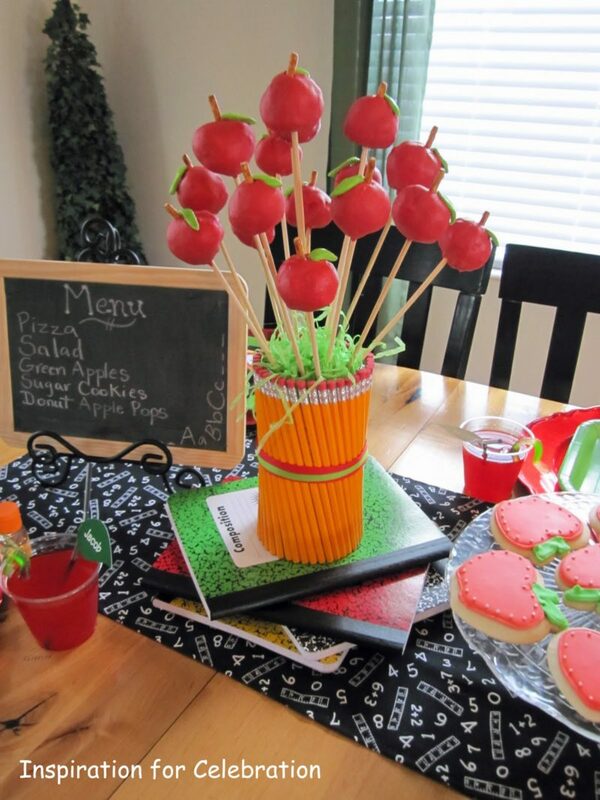 I was inspired to make the pencil vase and apple pops by a cute version at Shingdig Parties to Go. However, I decided to make mine with donut holes. You can see my Donut Hole Apple Pop tutorial here. I knew I wanted to elevate the centerpiece with books but I wasn’t sure what I was going to use. I was excited to find these “old school” composition notebooks in bright vivid colors! 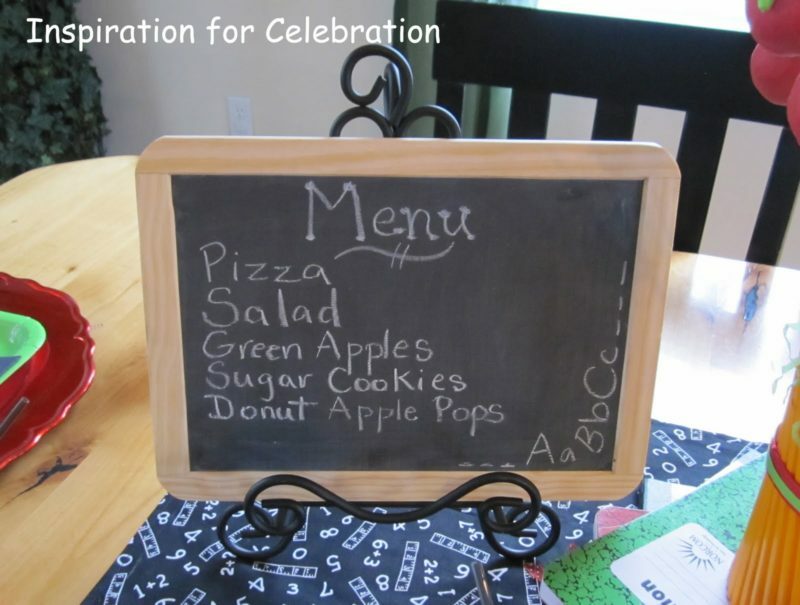 I am sure you’ll be seeing this chalkboard again. I think it is so versatile! 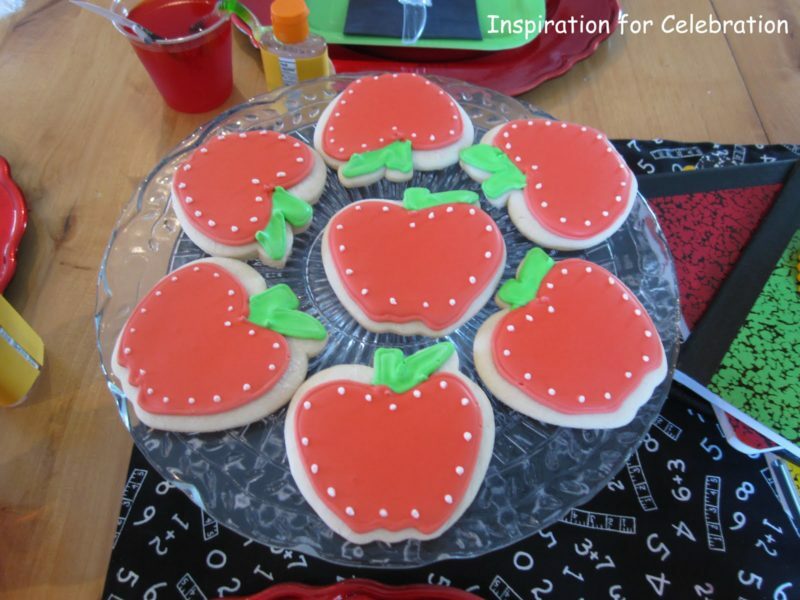 I love making and decorating sugar cookies. I have learned so much from following Bridget at Bake at 350. Check her out! I had hoped to make a fabric bunting for the party but ran out of time. 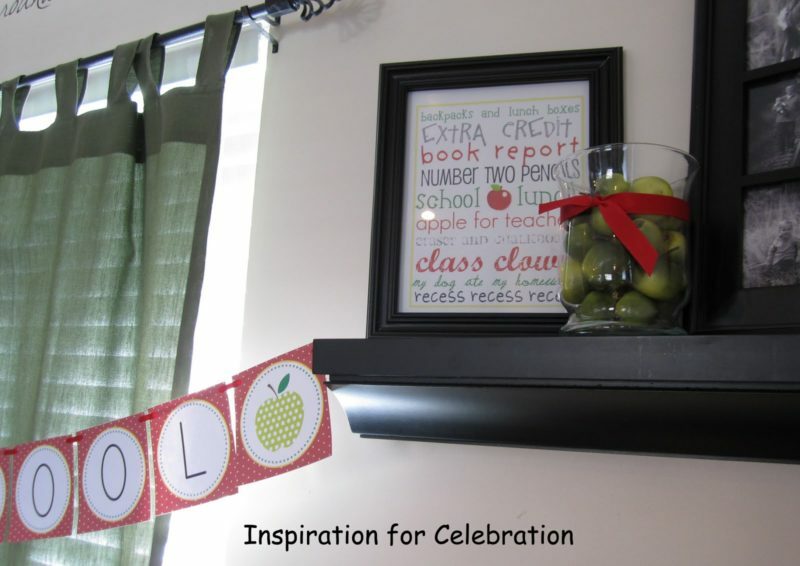 I am glad I ran out of time because I like the way this banner from Creative Magnolia Co pulled the whole apple theme together. 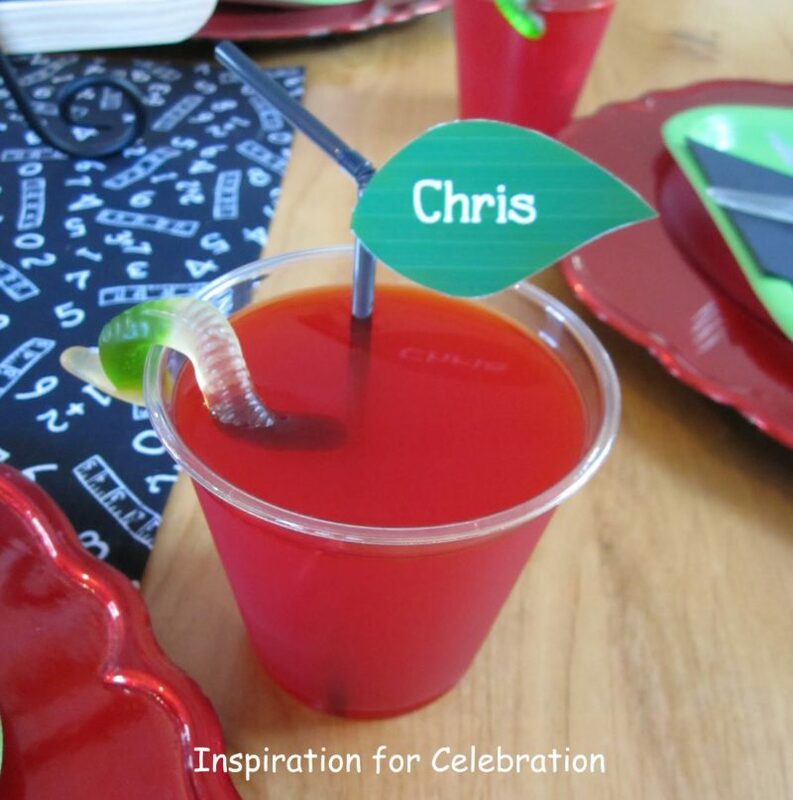 By the way, if you love free party printables you will want to head over to The Catch My Party Blog! I enjoy decorating my shelves to match. 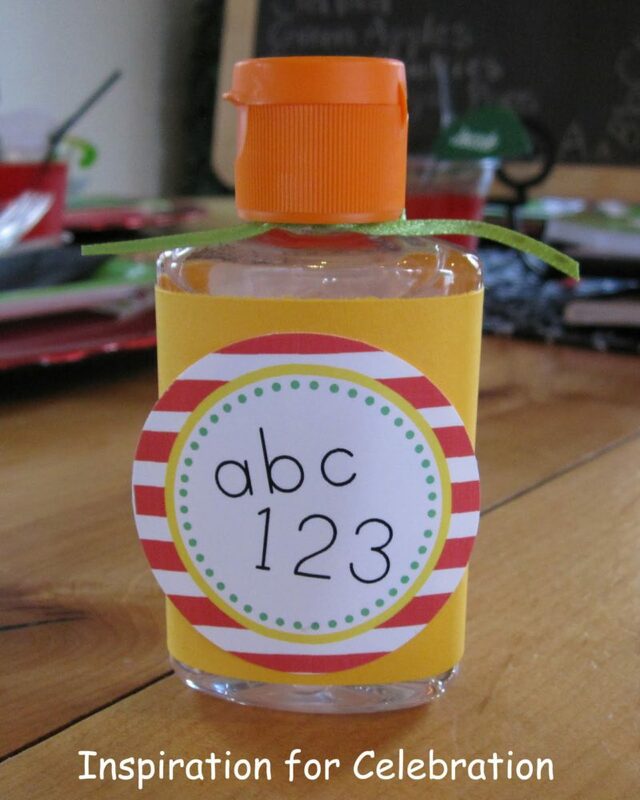 This adorable printable from Holiday Snob was just the perfect thing! Love it! 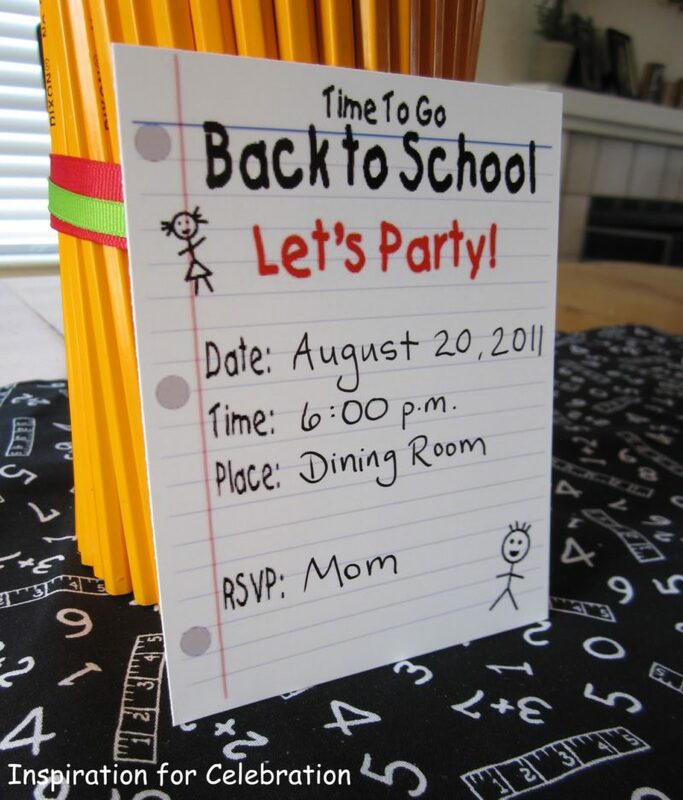 Last but not least, don’t you love this invitation by Kim at Kim’s Kandy Kreations. 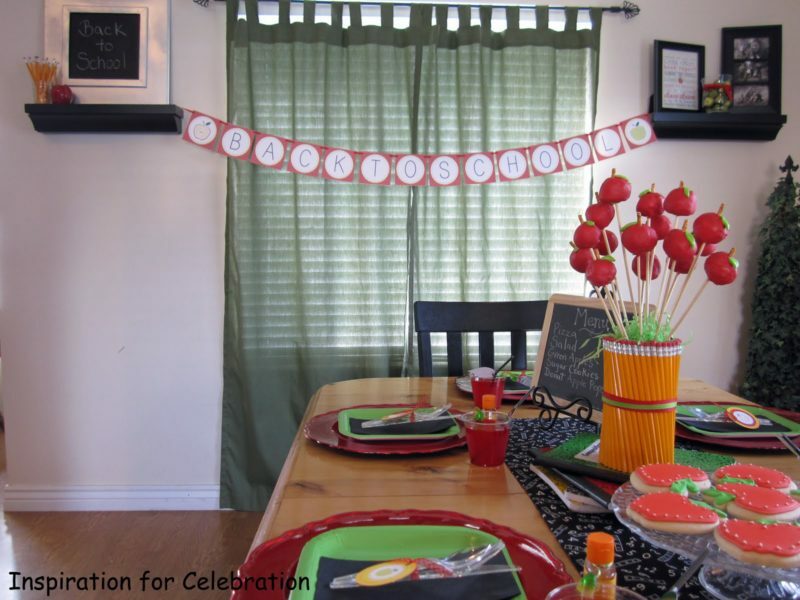 It may seem weird to use invitations at a family dinner, but the kids love knowing that something special is coming up and it really increases the excitement factor! After dinner we went around the table and said one thing that is exciting about school starting that begins with each letter of the alphabet. (A-apples, B-basketball, C-c…). 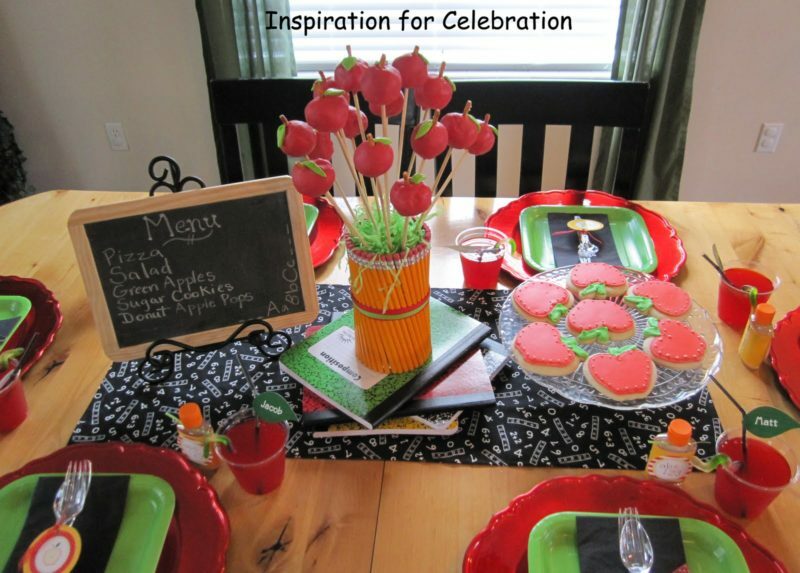 Thank you so much for letting me share your Budget Back to School Celebration, Christina!